It’s hard to express how much I really like this funky little ’70s pop song. Even before the iPod and MP3 players were all the rage, I would throw this track on mix CDs and listen to it on my portable player with headphones. I particularly remember one such occasion, years ago, running through LAX in a desperate attempt to catch a flight while this Boz Scaggs tune provided the soundtrack. I missed it. They don’t really make music like this anymore, do they? Smoove ain’t it? Oh HELL YEAH. I love this track too. It reminds me of summers at the beach when I was little, tuning in to the one station that came in clearly on the night air. I’ve got it on multiple playlists on the iPod. I love this song; it came out when I was 15, and had to be a “guilty pleasure”, because, in those days, we were all listening to…ahem…Styx, Kansas, Rush…blecch! Glad I outgrew that lil’ phase! Wish some of my friends had. Maybe the funkiest white boy to grow up in Dallas. Ever. We’ll claim him. Great album art too, btw. Boz did some sweeet blue eyed soul years prior to this album. 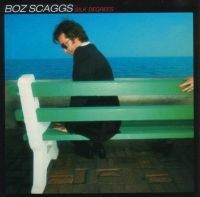 Boz Scaggs wasthe album, recorded at Muscle Shoals. Duane Allmann on too! Blog that, if you would. Great song by the way. Keeps summer swingin’. I was thinking about him the other day, that song “Jo-Jo” off the record with the fishnet leg. My brother & sister had that record when I was little and I was wondering when somebody was gonna give a shout-out to him. You did, hotdog. for whatever reason, this song really made an impression on me as a 3-year-old. Hell yea! I actually bought his Anthology CD (1969-1997) Great memories..
I’d already picked up on a few Boz LP’s in the years preceding the ‘Bicentenniel Spring’ of ’76 when Silk Degrees dropped, but nothing prepared me for ‘Lowdown’ and the rest of Silk Degrees. They DID play Lido into the ground, but I don’t think I could ever grow tired of ‘Lowdown’. Likewise, ‘Harbor Lights’ is an underappreciated masterpiece off of this album and while I’m in the mood for heaping praise on the Boz, ‘It’s Over’ and ‘Georgia’ are none too shabby, either.